Canopy and waterfall rappelling tours in Jaco are an absolutely must-do activity in Costa Rica! Dare to take the plunge? 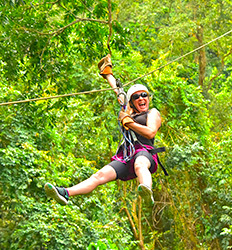 Zip-lines through the jungle canopy are in many ways synonymous with Costa Rica. Originally introduced in the 1970s, canopy tours have developed into one of Costa Rica's most popular activities. A high-flying, exhilarating canopy tour in Jaco is one of the best ways to experience the thrills and beauty of this adventure town in Costa Rica! 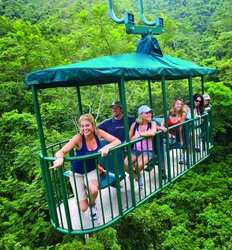 So harness yourself in and get ready for a Jaco canopy tour in the hills above the Pacific Coast of gorgeous Jaco Beach. Jaco Beach and the surrounding hills carved out by waterfalls and dense rainforest make this region perfect for canyoning and waterfall rappeling as well. 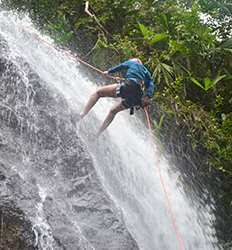 The Real Deal Tours offers you incredible waterfall rappel tours in Jaco you should not miss out on. Want a full day of fun in Jaco? Combine your Jaco canopy tour with a relaxing horseback riding tour or an exhilarating ATV or Buggy tour at our Vista Los Sueños Adventure Park. 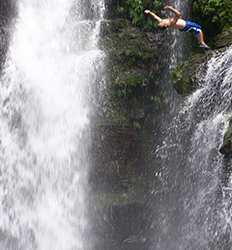 Below we have a list of all the Canopy, Waterfall Rappel & Canyoning tours in Jaco available to you. Pick your thrilling canyoning adventure with The Real Deal Tours and know you are getting the best deals in Costa Rica on the best tours in Jaco.